Explain program flow of BADI? Then declare the objects, classes and methods. At last, defining the Classes and methods as per as requirements of the end user. In which table the material master data is stored? MARA and MARC are the tables from where you can get the data for Material Master. Which commands are used for interactive reports? HIDE can be used in order to create an array of all hidden variables. When will we go for call transaction and when we will go for a session in BDC? Call Transaction can be used when the DATA is minimal. Sessions can be used to handle mass DATA or Voluminous DATA. With What extension does an ABAP program gets saved? SAP-ABAP saves all its programs internally in its database and not in external files like C, C++ and Java do. Hence there is no extension for a program in ABAP. When the get cursor command used in interactive lists? When the hidden information is not sufficient to uniquely identify the selected line, then the command GET CURSOR is used. The GET CURSOR command returns the name of the field at the cursor position in a field specified after the additional field, and the value of the selected field in a field specified after the value. Do we have to migrate all SAPscript forms to Smart Forms? There is no point in migrating all SAPscript forms already in use. Since SAPscript can still be used and will be available in the future, there is no need to. If you plan to migrate a SAPscript form, it is recommended that you check whether the benefit is worth the effort involved. What is a method in ABAP? Methods describe the functions of classes in ABAP objects. We can call methods using the call method statement.methods are introduced with the method statement & concluded with the end method statement.methods can only be defined in the implementation parts of classes. How to copy table across clients? Which are the various Events in Application Server? What is the role of ‘Refresh’ in Internal Table? 'Refresh' is the keyword which is used to clear the contents of a body in an internal table. How to find output type? Use table Table TNAPR / NAST in order to find output type. What is the Function module to popup contents in the internal table? State the system field for the current date? What is the keyword used to eliminate the leading zeros of a number field? Which are the various Events in Dialog Programs? What is some important characteristic of Recording Function? To create batch input sessions with the help of recorded transaction runs. To generate a batch input program with the help of recorded data. How to find the attributes of a data object or data type? DESCRIBE FIELD [LENGTH ] [TYPE [COMPONENTS ]] [OUTPUT-LENGTH ] [DECIMALS ] [EDIT MASK ]. How can we read selected lines of a database table into an internal table in packages of predefined size? SELECT * FROM INTO TABLE PACKAGE SIZE . Name the WILDCARD characters which can be used for comparing with character strings & numeric strings. How can we determine the table to which a field belong to by knowing only field name? A list of table where the field is used is will be shown. What are the layers of data description in R/3? The external layer is the plane at which the user sees and interacts with the data, that is, the data format in the user interface. This data format is independent of the database system used. The ABAP/4 layer describes the data formats used by the ABAP/4 processor. The database layer describes the data formats used in the database. What is a Data Class? The Data class determines in which table space the table is stored when it is created in the database. What is a Size Category? The Size category describes the probable space requirement of the table in the database. How many types of size categories and data classes are there? APPL0- Master data (data frequently accessed but rarely updated). APPL1- Transaction data (data that is changed frequently). APPL2- Organizational data (customizing data that is entered when system is configured and then rarely changed). USR1 – Intended for customer's own developments. What is the function of the transport system and workbench organizer? The function of the transport system and the Workbench Organizer is to manage any changes made to objects of the ABAP/4 Development Workbench and to transport these changes between different SAP systems. What is a table pool? A table pool (or pool) is used to combine several logical tables in the ABAP/4 Dictionary. The definition of a pool consists of at least two key fields and a long argument field (VARDATA). These are logical tables, which must be assigned to a table pool when they are defined. Pooled tables can be used to store control data (such as screen sequences or program parameters). How can we access the correction and transport system? Each time you create a new object or change an existing object in the ABAP/4 Dictionary, you branch automatically to the Workbench Organizer or correction and transport system. Domains, Data elements, Tables, Technical settings for tables, Secondary indexes for transparent tables, Structures, Views, Matchcode objects, Matchcode Ids, Lock objects. How is conversion of data types done between ABAP/4 & DB layer? Conversion between ABAP/4 data types and the database layer is done within the database interface. How is conversion of data types done between ABAP/4 & external level? Conversion between the external layer and the ABAP/4 layer is done in the SAP dialog manager DYNP. ACCP, Char, CLNT, CUKY, CURR, DATS, DESC, FLTP, INT1, INT2, INT4, LANG, LCHR, LRAW, NUMC, PREC, QUAN, RAW, TIMS, UNIT,VARC. F: Floating-point number in DOUBLE PRECISION (8 bytes). N: Numerical character string of arbitrary length. P: Amount of counter field (packed; implementation depends on h/w platform). V: Character string of variable length, length is given in the first two bytes. How can we set the table spaces and extent sizes? You can specify the extent sizes and the table space (physical storage area in the database) in which a transparent table is to be stored by setting the size category and data class. What is the function of the correction system? The correction system manages changes to internal system components. Such as objects of the ABAP/4 Dictionary. Local objects (Dev class$TMP) are independent of correction and transport system. What is a Development class? Related objects from the ABAP/4 repository are assigned to the same development class. This enables you to correct and transport related objects as a unit. What are the attributes of the data? What is the relationship existing between the various data elements? What functions does a data dictionary perform? Provision of information for evaluation. Ensuring that the data definitions are flexible and up-to-date. What are the features of ABAP/4 Dictionary? Integrated to aABAP/4 Development Workbench. Active in the runtime environment. What are the uses of the information in the Data dictionary? Information on fields displayed with F1 help. Possible entries for fields displayed with F4 help. Matchcode and help views search utilities. What are the basic objects of the data dictionary? In the ABAP/4 Dictionary Tables can be defined independent of the underlying database (T/F). ABAP/4 Dictionary contains the Logical definition of the table. A field containing currency amounts (data type CURR) must be assigned to a reference table and a reference field. Explain. As a reference table, a system containing all the valid currencies is assigned or any other table, which contains a field with the currency key format. This field is called as reference field. The assignment of the field containing currency amounts to the reference field is made at runtime. The value in the reference field determines the currency of the amount. A field containing quantity amounts (data type QUAN) must be assigned to a reference table and a reference field. Explain? As a reference table, a system table containing all the valid quantity units is assigned or any other table, which contains a field with the format or quantity units (data type UNIT). This field is called as reference field. The assignment of the field containing quantity amounts to the reference field is made at runtime. The value in the reference field determines the quantity unit of the amount. What is the significance of Technical settings (specified while creating a table in the data dictionary)? What is a Table attribute? What is the significance of Delivery Class? The delivery class controls the degree to which the SAP or the customer is responsible for table maintenance. Whether SAP provides the table with or without contents. Determines how the table behaves when it is first installed, at upgrade, when it is transported, and when a client copy is performed. What is the max. no. Of structures that can be included in a table or structure. What is the difference between a Substructure and an Append Structure? In case of a substructure, the reference originates in the table itself, in the form of a statement include…. In case of an append structure, the table itself remains unchanged and the reference originates in the append structure. To how many tables can an append structure be assigned. If a table that is to be extended contains a long field, we cannot use append structures why? Long fields in a table must always be located in the end, as the last field of the table. If a table has an append structure the append line must also be on the last field of the table. Can we include customizing include or an append structure with Pooled or Cluster tables? What are the two ways for restricting the value range for a domain? By stipulating a value table. What are the aggregate objects in the Dictionary? What are base tables of an aggregate object? The tables making up an aggregate object (primary and secondary) are called aggregate object. What are the 2 other types of Views, which are not allowed in Release 3.0? What is a Match Code? What are the two levels in defining a Match Code? What is the max no of match code Id's that can be defined for one Match code object? A match code Id is a one character ID that can be a letter or a number. Can we define our own Match Code ID's for SAP Matchcodes? Yes, the number 0 to 9 are reserved for us to create our own Match Code Ids for a SAP defined Matchcode object. What is an Update type with reference to a Match code ID? If the data in one of the base tables of a matchcode ID changes, the matchcode data has to be updated. The update type stipulates when the matchcode is to be updated and how it is to be done. The update type also specifies which method is to be used for Building matchcodes. You must specify the update type when you define a matchcode ID. Can matchcode object contain Ids with different update types? What are the update types possible? Update type A: The matchcode data is updated asynchronously to database changes. Update type S: The matchcode data is updated synchronously to database changes. Update type P: The matchcode data is updated by the application program. Update type I: Access to the matchcode data is managed using a database view. Update type L: Access to the matchcode is achieved by calling a function module. What are the two different ways of building a match code object? Logical structure: The matchcode data is set up temporarily at the moment when the match code is accessed. (Update type I, k). Physical Structure: The match code data is physically stored in a separate table in the database. (Update type A, S, P). What are the differences between a Database index and a match code? Match code can contain fields from several tables whereas an index can contain fields from only one table. Match code objects can be built on transparent tables and pooled and cluster tables. What is the function of a Domain? Non-standard conversions from display format to sap internal format and vice-versa are implemented with so called conversion routines. What is the function of a data element? Can you define a field without a data element? What is the difference between a structure and a table? A view is a logical view on one or more tables. A view on one or more tables i.e., the data from a view is not actually physically stored instead being derived from one or more tables. When two users simultaneously attempt to access the same data record, this is synchronized by a lock mechanism. Database utility is the interface between the ABAP/4 Dictionary and the underlying the SAP system. What are the basic functions of Database utility? Adjust database objects to changed ABAP/4 dictionary definition. What is Repository Info. Systems? It is a tool with which you can make data stored in the ABAP/4 Dictionary available. The alignment of a type 'c' field in a report is left Aligned. In the statement Write:/15(10) Ofal-lifnr. what do the number 15 and 10 stand for15 stand for the offset on the screen and 10 stands for the field length displayed. 'D' – Left, 'F'-Right, 'N'-Left, 'I'-Right, 'T'-Left. If s_time has the value '123456' how would you get an output of 12:34:56 with a single 'Write:' statement. In order to suppress the leading zeroes of a number field the keywords used are NO-ZERO. The total no of date formats that can be used to display a date during output is MM/DD/YY, DD/MM/YY, DD/MM/YYYY, MM/DD/YYYY, MMDDYY, DDMMYY, YYMMDD. The UNDER Command allows for vertical alignment of fields one below the other. In order to concatenate strings only for output purposes the command NO-GAP can be used in conjunction with the 'Write' statement. The no of decimal places for output can be defines within a write statement. (T/F). Data can be moved from one field to another using a 'Write:' Statement and stored in the desired format. (T/F). TRUE. Write: Date_1 to Date_2 format DD/MM/YY. In the statement Write:/15(10) lfa1-lifnr. The values 15 and 11 can also be defined by variables (T/F). Differentiate between the following two statements if any. No-difference. Except that uline is used outside the 'Write' Statement. The "SKIP TO LINE line number" is dependent on the LINE-COUNT statement included in the report statement of the program. In order to skip columns the command used is POSITION <n>. In order to have boldfaced text as output the command used is Write:<f>INTENSIFIED. Background and foreground colors can be interchanged using the command Format Inverse. In order to restore the system defaults for all changes made with the format statement is Format Reset. Like ULINE the statement VLINE is used to insert vertical lines. (T/F). Suppressing the number signs (+/-) is carried out using the addition NO-SIGNS to the Write statement. (T/F). If SY-UZEIT has the value 6:34:45 it can be displayed as 063445 using No Edit Mask. If the variable "Text" has the value 'ABCDEF' the output for the statement "Write:/Text+2(3)" will be "CDE"
The fields specified by select-options and parameters statement cannot be grouped together in the selection screen. (T/F). Selection Texts in the text elements of the program helps in changing the displayed names of variables in the parameters statement. Type F datatype cannot be used to define parameters. Rounding off of values can be carried out using the write statement. (T/F). How would you define the exponents for a type 'f' field? How would you format the output as left, centered or right-justified using the write statement. If the same formatting options were used for a WRITE statement that follows the FORMAT statement, which settings would take precedence. The settings in the Write Statement. All formatting options have the default value OFF. (T/F). Dynamically: FORMAT <option1> = <var1> <option2>=<var2>…. The page footer is defined using the statement END-OF-PAGE. To execute a page break under the condition that less than a certain number of lines is left on a page is achieved by RESERVE n lines. The RESERVE statement only takes effect if output is written to the subsequent page. No blank pages are created and it defines a block of lines that must be output as a whole. (T/F). To set the next output line to the first line of a block of lines defined with the RESERVE statement the statement BACK is used. What is the limit for the length of a page if the page length is not specified in the report statement. How would you start the printing process from within the program while creating a list? You can change the width of pages within list levels triggered by page breaks. (T/F). Hotspots are special areas of an output list used to trigger events. (T/F). To designate fields as hotspots at runtime, use FORMAT HOTSPOT = <h>. Horizontal lines created with ULINE and blank lines created with SKIP can be formatted as hotspots. (T/F). How would you suppress the display of a parameter on the selection screen? Can you assign a matchcode object to a parameter? If so how? Yes. PARAMETERS <p>……..MATCHCODE OBJECT <obj>……..
How can Symbols or R/3 icons be output on the screen? In the standard setting, you cannot create empty lines with the WRITE statement alone. (T/F). The system field, which indicates success or failure of a SQL operation, is SY-SUBRC. What is the syntax for specifying database table name at runtime in SELECT statement. How do you read selected lines of database table into an internal table in packages of predefined size. Name the WILDCARD characters which are used for comparisons with character strings & numeric strings. '%' and '-'. In SELECT statements can you specify a variable in WHERE condition or a part of the condition, if so what is the syntax. Name the ABAP/4 key words, which are used to change the contents of database table. How to specify a client for database table processing. SELECT * FROM SPFLI CLIENT SPECIFIED WHERE MANDT BETWEEN '001' AND '003'. How do you write a DATA object from ABAP/4 program to ABAP/4 memory and restore the same from memory to program. EXPORT <f1> [FROM <g1>] <f2> [FROM <g2>] ... TO MEMORY ID <key>. The ID <key>, which can be up to 32 characters long, identifies the data in memory. You can group any complex internal data objects of an ABAP/4 program together in data clusters and store them temporarily in ABAP/4 memory or for longer periods in databases. You can store data clusters in special databases of the ABAP/4 Dictionary. These databases are known as ABAP/4 cluster databases and have a predefined structure. Storing a data cluster is specific to ABAP/4. Although you can also access cluster databases using SQL statements, only ABAP/4 statements are able to decode the structure of the stored data cluster. Statements used to delete data objects in ABAP/4 memory FREE MEMORY [ID <key>]. How will you create a file on application server. Open dataset <dsn> for output. ABAP/4 statement for opening a file on application server for reading Open dataset <dsn> for input. Open dataset fname for output. Name the function modules to write data from an Internal Table to the Presentation Server. Name the function module that can be used to give information about files on Presentation Server and about its Operating System. Name the ABAP/4 key word, which is used to clear the Headerline of an Internal Table. Name the function modules to read data from Presentation Server into an Internal Table. Name the ABAP/4 keywords to initialize an Internal Table with and without headerline. How to determine the attributes of an internal table? DESCRIBE TABLE <itab>[LINES <lin>] [OCCURS <occ>]. Name the ABAP/4 key word for searching a string in an Internal Table. SEARCH <itab> FOR <str> <options>. Searches table<itab>for a word containing the character string specified in <str>, where other characters might separate the characters. The first letter of the word and the string <str> must be the same. Searches table<itab> for <str>, starting at line <line1>. <lin1> can be a variable. Searches table <itab>for <str>upto line <lin2>. <lin2>can be a variable. What are the different attributes that can be assigned to a variant? The different attributes that can be assigned to a variant are…. Enter a short, meaningful description of the variant. This may be upto 30 characters long. Specify whether you want to use the variant in background processing only, or in online environment as well. Mark the field if you want to protect your variant against being changed by other users. Mark this field if you want the variant name to be displayed in the catalog only, but not in the F4 value list. The system displays whether the field is a parameter or a select option. Mark this field for each field on the selection screen you want to protect from being overwritten. Values that you mark this way are displayed to the users, but they cannot change them, that are they are not ready to accept input. If you mark this column, the system will not display the corresponding field on the selection screen the user sees when starting the report program. Mark this column if you want to set the value for this field at runtime. Is it possible to create new dynamic programs during runtime of an ABAP/4 program? If so how? DATA CODE (72) OCCURS 10. INSERT REPORT 'ZDYN1' FROM CODE. INSERT REPORT REP FROM CODE. Data types can be elementary or structured (T/F). The amount of memory associated with a data type is ZERO. Data objects are the physical units a program uses at runtime. (T/F). What are the three hierarchical levels of data types and objects? Program-independent data, defined in the ABAP/4 Dictionary. Internal data used globally in one program. How would you find the attributes of a data type or data object? Differentiate between static and dynamic step loops. What are the two ways of producing a list within a transaction? What is the use of the statement Leave to List-processing? When will the current screen processing terminates? How is the command Suppress-Dialog useful? Suppressing entire screens is possible using this command. This command allows us to perform screen processing "in the background". The system carries out all PBO and PAI logic, but does not display the screen to the user. Suppressing screens is useful when we are branching to list-mode from a transaction dialog step. What happens if we use Leave to list-processing without using Suppress-Dialog? If we don't use Suppress-Dialog to next screen will be displayed but as empty, when the user presses ENTER, the standard list output is displayed. How the transaction that are programmed by the user can be protected? What are the modes in which any update tasks work? What is the difference between Synchronous and Asynchronous updates? A program asks the system to perform a certain task, and then either waits or doesn't wait for the task to finish. In synchronous processing, the program waits: control returns to the program only when the task has been completed. In asynchronous processing, the program does not wait: the system returns control after merely logging the request for execution. SAP system configuration incluedes Dialog tasks and Update tasks. Dialog-task updates are Synchronous updates. Update –task updates are Asynchronous updates. What is the difference between Commit-work and Rollback-Work tasks? Commit-Work statement "performs" many functions relevant to synchronized execution of tasks. Rollback-work statement "cancels: all reuests relevant to synchronized execution of tasks. What are the different database integrities? All SAP Databases are Relational Databases. What does a lock object involve? What are the different kinds of lock modes? How can a lock object be called in the transaction? By calling Enqueuelocklock objectlock and Dequeuelocklock objectlock in the transaction. What are the events by which we can program "help texts" and display "possible value lists"? In what ways we can get the context sensitive F1 help on a field? Data element additional text in screen painter. Using the process on help request event. A roll area contains the program's runtime context. In addition to the runtime stack and other structures, all local variables and any data known to the program are stored here. How does the system handle roll areas for external program components? Transactions run in their own roll areas. Reports run in their own roll areas. Function modules run in the roll area of their callers. Does the external program run in the same SAP LUW as the caller, or in a separate one? Reports run with a separate SAP LUW. Function modules run in the same SAP LUW as the caller. EXPORTING: for passing data to the called function. IMPORTING: for receiving data returned from the function module. TABLES: for passing internal tables only, by reference (that is, by address). CHANGING: for passing parameters to and from the function. How can we pass selection and parameter data to a report? How to send a report to the printer instead of displaying it on the screen? SUBMIT RSFLFIND…TO SAP-SPOOL DESTINATION 'LT50'. How can we send data to external programs? What is full form of BDC Session? What are the steps in a BDC session? How do you find the information on the current screen? The information on the current screen can be found by SYSTEM ô€ƒ† STATUS command from any menu. How do you save data in BDC tables? The data in BDC tables is saved by using the field name 'BDC_OKCODE' and field value of '/11'. In all BDC tables the last entry is to save the data by using the field name BDC_OKCODE and a field value of '/11'. What is a multiple line field? How do you populate data into a multiple line field? Write the BDC table structure. Program CHAR (8) Program name of transaction. DynPro CHAR (4) Screen number of transaction. DynBegin CHAR (1) Indicator for new screen. Fnam CHAR (35) Name of database field from screen. Fval CHAR (80) Value to submit to field. Does the CALL TRANSACTION method allow multiple transactions to be processed by SAP? Does the BDC-INSERT function allow multiple transactions to be processed by SAP? What is the syntax for 'CALL TRANSACTION'? What do you mean by the term 'ABAP data dictionary'? ABAP data dictionary is used for describing the logical structures of the objects which are utilized in the areas of application development. This is also used for displaying the underlying relational database in tables. What are the various types of data dictionary objects? Tables, structures, views, domains, data elements, lock objects, Matchcode objects. SAP Smartforms can be used for creating and maintaining forms for mass printing in SAP Systems. How would you define ABAP BDC? Batch Data Communication (BDC) is a set of instruction which SAP can follow for executing a transaction without any intervention from the user. The instructions list the sequence in which a transaction's screens are processed and which fields have to be populated with data on which all screens. In BDC, list down all the functional modules which are used in sequence? List all the different the components of SAPscript? Function modules such as open_form, close_From, Read_text etc. Business Add-In or BADI is referred to as a new SAP Object Oriented enhancement technique which is utilized for adding our own business functionality to the already pre-existing SAP standard functionality. BADI can also be inserted into the SAP System meant for accommodating the user requirements and these are very precise to be included in the standard delivery. How would you describe the internal tables? Internal tables are meant for serving the purpose of pulling the data from a fixed structure and preserving it in the working memory in ABAP. The data is preserved line by line in memory, and each line encompasses similar structure, and these data objects are all dynamic. Organization Data: The data here is customized and is entered into the system once the system is configured, and is very rarely altered. How can we format the data prior to the write statement in the report? The user can format the report output by using the loop event. OO ABAP (ABAP Objects) is a superset of normal ABAP. It supports most normal ABAP statements (almost downward compatible) along with adding all object orientation language elements, providing for instance inheritance, class definitions and object instantiation. In reports what are benefits of using ABAP objects? ABAP objects serve as the root for all your program and reports. The event concept is explicit. Can the user create an ABAP program without using Y or Z? All non Y or Z programs are standard SAP programs, therefore the user cannot create an ABAP program without using Y or Z. A foreign key relationship can be referred to a relationship that can be defined between tables and should be clearly defined at field level. Foreign keys are utilized for ensuring consistency of data. The Data entered must be verified against existing data in order to clear out any contradiction. It must be ensured that while defining foreign key relationship cardinality should be very clearly specified. Note: Cardinality lists the number of dependent records or how referenced records are achievable. 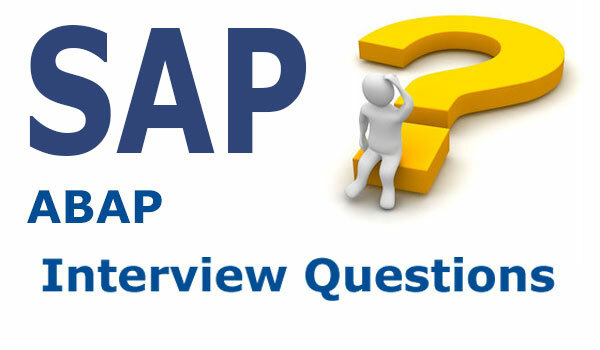 What are various types of ABAP report in SAP? List the various steps involved for adding value help for the parameter in ABAP CDS Analytical Query? What is Predictive Search Helps? An ABAP search provides type-ahead functionality primarily for the elementary search helps and are known as Predictive Search Helps. How can the user add subtotal text in ABAP ALV Grid? By Creating an ABAP Program in SE38 transaction. Create and ALV report by using the function module REUSE_ALV_GRID_DISPLAY. Populate the SUBTOTAL_EVENT in IT_EVENTS parameter in the REUSE_ALV_GRID_DISPLAY. List the benefits of using ABAP in eclipse over ABAP in SAP GUI? The user can create CDS views and AMDP's which ultimately push down the code to database level and help in speedy access to records. All the CDS views created in IDE are available in SE11 and user can utilize them in your programs in SE38. User can make modifications in their program while debugging and activating your program while in debug mode and user can then proceed with debug along with the new changes. User can create multiple projects and create your stuff inside it. In WEB IDE, the User has the advantage of using advanced SQL. Distinguish between READ TABLE <ITAB> WITH KEY and READ TABLE <ITAB> WITH TABLE KEY in SAP ABAP? For all table types, the search is linear. The runtime is in linear relation to the number of table lines. Standard tables: It is a linear search, where the runtime is in linear relation with the number of table entries. Sorted tables: it is binary search where the runtime is in logarithmic relation to the number of table entries. Hashed tables: By using the hash algorithm of the internal table, the entry is found. The runtime is completely independent of the number of table entries. Define field symbols in ABAP? Field symbol points (known as pointers in C language) to something. That could be a table, a field or simply nothing. By nothing, I am referring to that structure of a field symbol which can be dynamically determined. A field symbol can be utilized in any operand position in this is visible and also matches the typing defined utilizing typing. How many ABAP report types in SAP are available in reports attributes screen? There are 7 ABAP report types available in SAP in the reports attributes screen. Basic List: This is the simple reports. Statistics: entails reports with statistical functions such as percentages, Averages. Ranked Lists: For analytical reports. How can the user create ABAP/4 Query in SAP? For creating an ABAP/4 Query, the programmer should create a user and a functional group. The functional group can be created by using with or without logical database table. Finally, assigning the user group to functional group. Finally, creating a query on the functional group generated. What is the difference between se16 and table maintenance generator? Table Maintenance Generator (TMG) is a tool which is created using t-code SM30. TMG is used to create a equipment by which customized tables created by end users can be changed as required, such as making an entry to that table, deleting an entry etc. How should the user tick an option in Standard Tcode like LB10 along with 'Partially Delivered'? In case there is no additional condition meant for checking the 'Partially Delivery' checkbox, the user can then select the 'Partially Delivery' checkbox by using Transaction variant in SHD0 transaction. Once the transaction variant has been created, then activating the variant and checking the LB10 transaction. How can the user SUBMIT PROGRAM with Selection Screen For a SLIN T-code? User can utilize the FM EXTENDED_PROGRAM_CHECK instead of SUBMIT REPORT. This will provide you similar results. I am required to update equipment status as inactive & delete. So I am using function module STATUS_CHANGE_INTERN_VB & this is working fine, however, it doesn’t have exceptions for handling the error messages & even sy-subrc getting 0 if it fails also. Would request you to please suggest me how to handle this scenario? Is there any BAPI to update status in IE02? This FM is an ‘update task’ FM, generally Open-SQL statements, not much check, so no to be called in customer development. The best solution would be a BAPI (this is easy to find with any search tool) and when none is available or without required parameter some ‘dialog’ FM like STATUS_CHANGE_INTERN/EXTERN after analyzing the application behaviour and if BDC is also no longer suitable. In ABAP can the user write select * in the loop? This is not recommended, as it will cause a major performance issue. It will run the query every time it loops and you are using “Select * …” which means you are fetching all fields of that table, assuming if tables have millions of entries then in every iteration, your select query will go around millions of records in the table. Therefore, it could lead to serious performance issues. Instead of this, it is advised that you use 'For all entries…' the statement, it will fulfil your requirement. What is the difference between a singleton and a static class ABAP? A singleton is a design pattern where the class is required to create objects. The class ensures that only one object exists for every internal session which is available to consumers. Therefore, when you create a singleton class it does not allow you to create multiple instances of the class, instead, a single instance will be created which behaves as a global access point to reference that class throughout the lifetime of the application component. A class which only contains static components and no instance components is known as a static class. The user can directly access the components using the “=>” operator. A global static class is loaded once with its class pool into the current internal session. Like every ABAP program, it cannot be clearly deleted from the session. In subclasses, the static methods (declared using CLASS-METHODS) of a class cannot be redefined. What are the two methods to declare input field as mandatory? 1.parameter: abc type xyz obligatory. message 'field abc is mandatory' type 'E'. 1. loop at lt_tab into lw_tab. lv_var = lv_var + 1.
lv_var1 = lv_var mod 5. What is the use "Condense" key word in ABAP? Using condense keyword in string all consecutive blank spaces are converted into a single space. 10. Statements used to delete data objects in ABAP/4 memory FREE MEMORY [ID ].